sanghawalks: Walking as Sangha actually doing it! Walking in public. 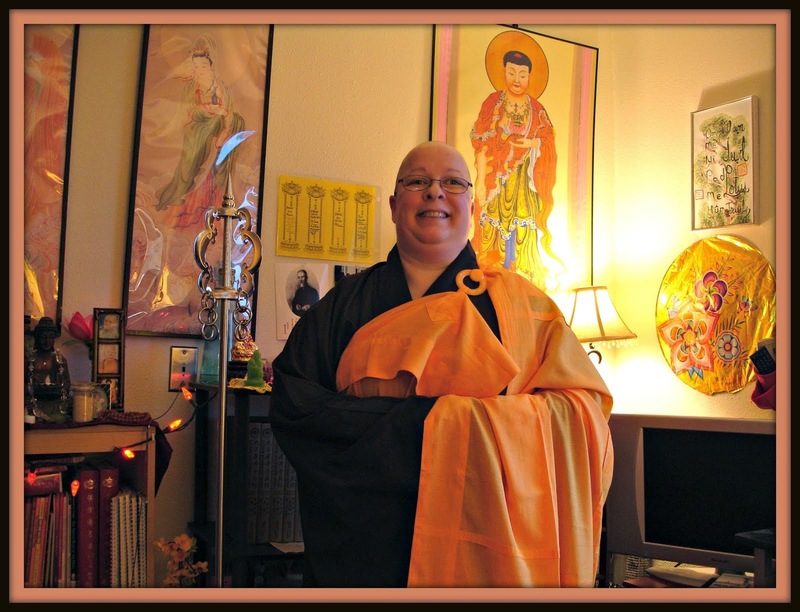 How we deport ourselves as Sangha matters to us. There are times I just plain wonder about myself though. Due to my injuries in hip and back my walking is just not up to par with regular folks. I feel ashamed when people make embarrassing or rude comments about my walking. I want to walk perfectly, but the recovery process of my hip and legs is awfully slow. Even when I was visiting a monastery, the laywomen quickly named me the "Dancing Master" due to my sway being exaggerated because of the hip injury. I was in lots of pain and needed my walker. But I was trying to tough it out and used one cane until it was too extreme, then I pulled out the second cane and to my relief the edge was taken off within a few days. But their sneering kept up. I felt so sorry about that. 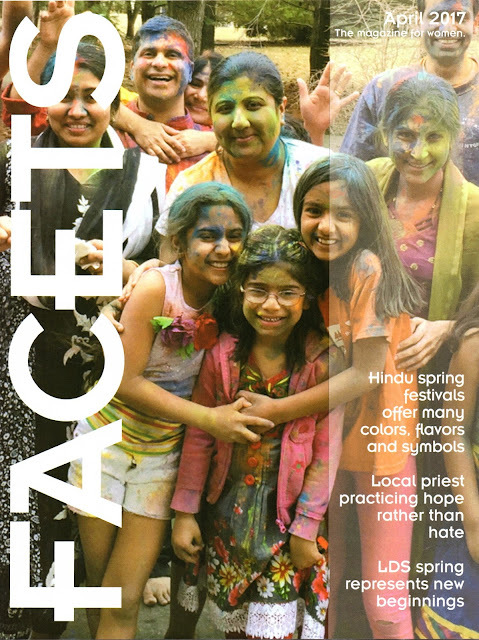 Deportment in temples is important and I know it. When you can't deport yourself well due to an injury like mine you have got to face it's reality. Hiding away is not an option, no matter who sees you. Elders see you and the laity are quick to make rude remarks about you in front or behind you. That's life. You are judged on this image rather quickly and it stays in their brains long after you leave. I've had the unfortunate injury for years after leaving the temple where I suffered pressure to lift well beyond my capacity and denied access to medical and proper amount of exercise. That's the way it was both good and bad, it was my lot. Being American I always thought that it would not be that way in America. But in actual experience it was and is not always up to you exactly how you want to live your daily life in community. I am not saying community is bad. It's great! I am a big fan of living in community. But it is important to be very familiar with your hosting community or your residing community. You need to investigate each one so most of your criteria are being met, it won't be possible to meet all of your expectations but as I found out, you need to be focused on healthy living and access to fresh air and the design of the place be very beneficial to your need of exercise and good fresh food. If you find yourself in a situation like I have where your body is injuried and you are in a temple or monastery. You have a right to ask for accomodation, and being caring monastics they can offer advice and try to work around your injuries. You should have access to health care providers to deal with your condition. If you can get some health insurance, if you cannot then try to see if they have visiting doctors... most if they don't have health insurance will have a pretty good program where visiting nurses, doctors and specialist will come monthly or every 2 weeks. Find out where and how to arrange visits. Social services will come to you if you need them. Call them. Ask for a home visit. They have people who do this in all 50 states. BTW modest swimwear is available, just search for it. Amazon has lots. If you can just buy a swimsuit and wear your monastic shirt over it with cut off pants or baggy shorts. That's good enough. More later... 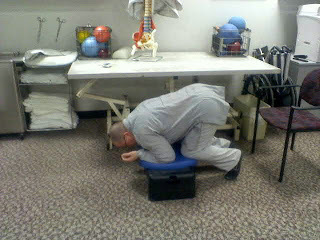 Here is me doing physical therapy retraining my hip and back to do our bowing practice in Chinese Buddhism. My PT people were great, they fixed up a homemade bowing platform from a step and some soft cushions. It works well. Let your PT ppl be a part of your Buddhist practice, they will get benefits and become more excited and the good seeds get planted in that way!